The US is to send 560 more military personnel to Iraq to help in the fight against so-called Islamic State (IS), Defence Secretary Ash Carter has said. 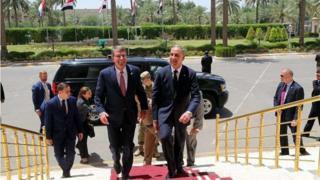 It will bring to about 4,650 the number of US personnel in Iraq, most of them serving in training and advisory roles. The extra troops, including engineers and logistics experts, would help local forces planning to retake the IS stronghold of Mosul, Mr Carter said. He made the announcement on a surprise visit to the Iraqi capital, Baghdad. Troops from the new deployment will be stationed at Qayara airbase, which was recaptured from IS militants by Iraqi government forces on Saturday. The facility is about 65km (40 miles) south of Mosul, IS's last urban bastion in Iraq. "These additional US forces will bring unique capabilities to the campaign and provide critical enabler support to Iraqi forces at a key moment in the fight," Mr Carter said. IS seized control of Mosul in June 2014 after routing the Iraqi army. It is the biggest city ruled by IS in either Iraq or neighbouring Syria. Iraqi Prime Minister Haider al-Abadi has pledged to retake Mosul from IS before the end of the year, though it is unclear when a concerted campaign will begin. The latest US troop increase in Iraq comes just over two months after President Barack Obama announced the deployment of an extra 250 soldiers to Syria, adding to the 50 that were already on the ground.